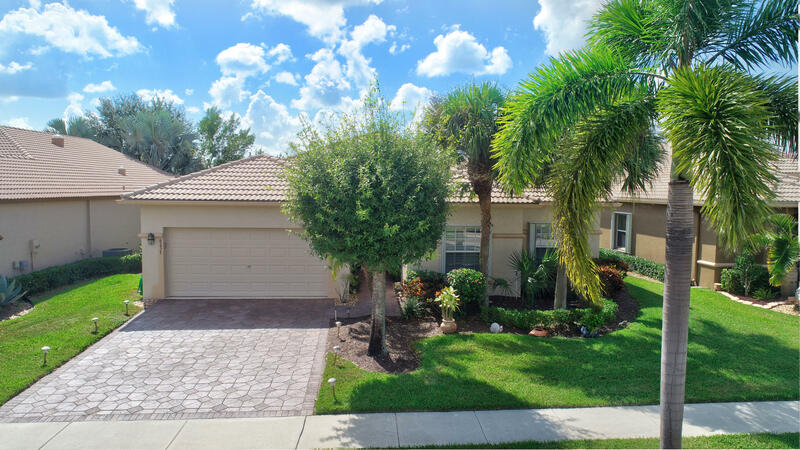 GORGEOUS HOME ON SERENE LAKE IN DESIRABLE OVER 55 COMMUNITY, VENETIAN ISLES! REMODELED KITCHEN WITH WHITE SHAKER CABINETS, GRANITE COUNTERTOPS WITH BEAUTIFUL GLASS BACKSPLASH, LED LIGHTING OVER & UNDER CABINETS, 2 YR OLD A/C, 1 YR OLD WATER HEATER, CROWN MOLDING THROUGHOUT, CUSTOM WINDOW TREATMENTS AND NEW HUNTER DOUGLAS SHADES, NEW CRYSTAL CHANDELIERS, ACCORDION SHUTTERS & LEADERS/GUTTERS AND SO MUCH MORE! THIS HOME IS PRICED TO SELL AT A REDUCED PRICE OF $389,900. DONT MISS IT! COME JOIN THE ACTIVE VENETIAN ISLES COMMUNITY WITH CLUBS, SHOWS, CARDS, TENNIS & PICKLE BALL. * DINING ROOM & FOYER FIXTURES NEGOTIABLE*.